Honda's 2017 Pilot SUV provides 3-row comfort and convenience in a vehicle noted for its reliability and strong resale. This 3rd-generation Pilot is slightly smaller than the last, but the design is sleeker and more upscale. The Pilot sacrifices some interior room to the design, making it smaller inside than the aging Chevrolet Traverse, but larger than Ford's Explorer. I have a 2017 Pilot Touring. This vehicle does everything well. The 280 HP is well suited to this vehicle. 0-100 km in 6.5 seconds. It handles great. The interior is great. I’d like to see some contrasting colours but it’s low on my list of must haves. The 9 speed transmission was a bit clunky at the start but the software updates took care of that. It’s very comfortable. Seat adjustments are great. Lights are ok but I upgraded the inside and out with aftermarket LEDs. It’s nimble and is a dream on the Highway. I drove 37 hours straight from Calgary Alberta to Ottawa Ontario and got 8.4 Litres per 100 KM. (I would love to punch the person in the Canadian Government who invented this measurement) kilometres per Litre would be simpler and more natural. I can’t understand those who criticize it for not having a volume knob. Grow up. In short if you feel that this vehicle will suit your needs BUY IT!! 2017 Honda pilot touring best investment we've made. My 2017 Honda pilot touring has a ton of space. My daughter plays softball which causes us to do a lot of road travel. The pilot is roomy, has a entertainment system, a ton of hook ups to charge electronics so the kids are never bored. The best part of the entertainment feature is that the kids can watch their movie using headphones and the other can still enjoy their music at the same time. There are also a ton of safety features, like parking assist so you never have to worry about parking or reversing. Lane assist helps you stay in your lane especially on the longer drives, and the navigation is easy to use/set up. All the other soccer moms will envy you. 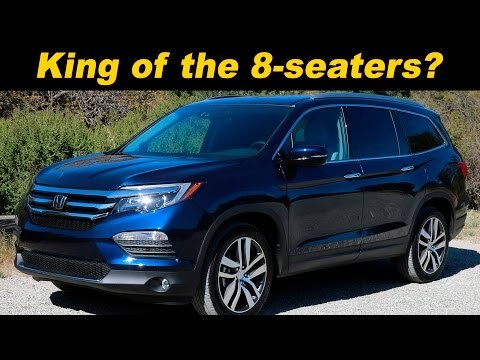 The 2017 Honda pilot has features galore! My favorites would be the lane assist, heated /cooled seats, power driver and passenger seat, heated steering wheel, navigation, 2nd row bucket seats make it easy for passengers to get in and out. 3rd row seats fold flat for extra room, but once up, there's still room for someone to sit and not be cramped. Enough room for an adult. Minor issues: panoramic roof visor rattles, electrical issues that were fixed quickly and without problem. Turned out to be a computer issue that was addressed. There were a few faults in the paint.